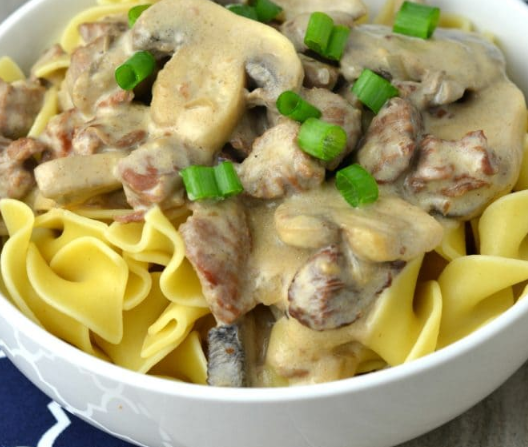 We are serious pasta eaters in my house and one of our go-to dishes is Beef Stroganoff. There is just something about this hearty meal that really soothes the soul in winter (you know, the time of year when calories don’t count). In a large Ziplock Bag, toss togther flour, salt and pepper and stew meat until evenly coated. Set your Instant Pot to Sauté setting and add butter. Add beef and cook for about 3-5 minutes until beef is browned on each side. Add onion and garlic and cook for about 2 more minutes. Scoop out beef with slotted spoon and set aside. Add beef broth and worchester sauce.Then, de-glaze pan (scrape with a wisk to get all of the browned bits off). Place the lid on the Instant Pot. Select the "Meat/Stew" setting on the Instant Pot and set the timer for 35 minutes. Make sure the pressure release valve is in the sealing position. When done, quick release the pressure valve, open up the lid carefully, and add sour cream, spicy mustard, and mushrooms. Stir and let it simmer for about 10 minutes or until the mushrooms are cooked through. Add more salt, pepper to taste. If desired thicken the sauce with a little corn starch slurry or flour mixed with water. Serve over prepared noodles or potatoes.